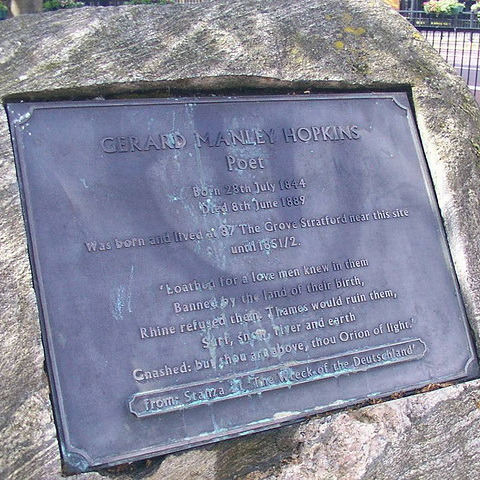 Gerard Manley Hopkins, poet, born 28th July 1844, died 8th June 1889, was born and lived at 87 The Grove Stratford near this site until 1851/2. The Telegraph reported the erection of this plaque and explains the Stratford connection of the 'Wreck of the Deutschland'. Seamus Heaney unveiled the plaque and performed at a poetry reading later in Stratford Town Hall as part of the celebrations for the 150th anniversary of Hopkin's birth. December 2011 - metal commodity prices at a high and the theft of memorial plaques has become a common occurrence, which probably explains the sorry state of this memorial - sans plaque. We are indebted to Sludgegulper for the 2008 picture of the plaque. 2015: Richard Durack tells is that the plaque was replaced in 2012 before the start of the London Olympics. Hopkins's birth-place, a substantial Victorian house, was bombed in WW2 and later pulled down.